Tonight, Tuesday 27 at Meta House from 6 pm, Cambodian Living Arts hosts a music exchange with renowned Israeli saxophone player Amir Gwirtzman, who shares his passion for woodwind instruments with local players in a collaborative performance. Then later this evening at Meta House at 7 pm, a screening of two documentaries about Cambodia’s late master painter Svay Ken: Passing knowledge by Erin Gleeson and Svay Ken Talks by Nico Mesterharm. Also tonight, Tuesday 27, following on from last week, Orangutan Swing again presents DrawUp at Cōnekla (St 51, between St 352 and St 360). It’s drawing, it’s talking, it’s improvising, it’s something new led by Henrik Akesson. BYO materials, from 6 pm. On Wednesday 28, at 6 pm, a special screening at Bophana Center of the documentary In Utero Srebrenica, in the presence of the director, Giuseppe Carrieri, with Q&A to follow. 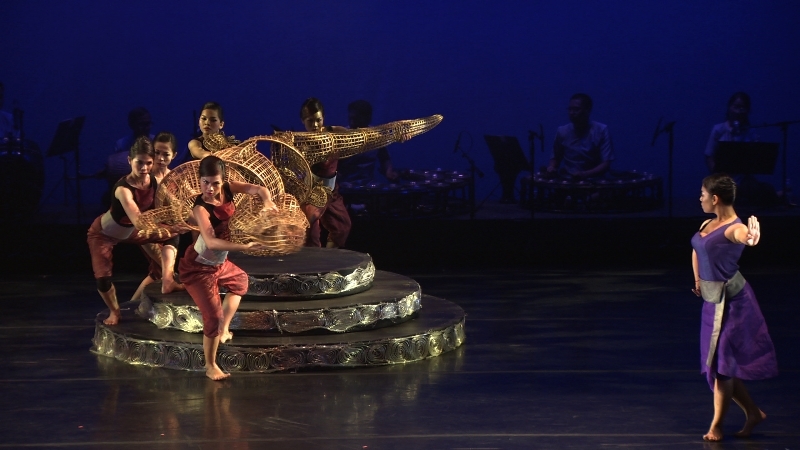 At Java Café on Thursday 29, Sophiline Arts Ensemble presents a preview of their dance, A Bend in the River, which will be presented in full at Chaktomuk Theatre next month. The work mixes between dance, theatre, puppetry and music, and the artists will be present to discuss the work and process. At the preview, special VIP tickets for the 14 June performance will be available to attendees before they go on sale to the general public. The show starts at 6.30 pm. Up in Battambang on Friday 30, Lotus Bar and Gallery (#53, St 2.5) presents, The Revolution will not be televised, a monthly spoken word and performance night, featuring the best of Battambang’s poets, performers, alternative musicians and artists. From 7:30 pm. Any Phnom Penh poets or performers want to make the trek? They’d love to hear from you. On Saturday 31, Chhan Dina returns to Phnom Penh Community College to host a double clay workshop: head sculpture in the morning, vase or bowl in the afternoon. Bookings essential. Saturday 31 also is the commencement of the second International Film Heritage Festival, nine days of over 50 films from all over the world, on the theme of laughter. International guests include French actress Catherine Deneuve and filmmakers Brillante Mendoza (Philippines) and Anthony Chen (Singapore), but more importantly residents of Phnom Penh have the chance to experience a broad range of cinematic delights, mostly free of charge. Everyone from Chaplin to Tati, Monty Python to Marilyn Monroe to the Marx Brothers, and even a whole mini-season of James Bond parodies. All screenings at Chaktomuk Theatre and Bophana Centre, with additional activities at the Institute Francais. More infoJava’s monthly Open Stage poetry event is seeking a host. You don’t need to be a poet or a writer, but it might help. Please contact outgoing host gregbem@gmail.com if you are interested in getting involved. If you are a venue or artist and would like to receive a weekly reminder to provide Kumnooh with an upcoming event or activity, please contact fabianhipp@kumnooh.com and ask to be added to the venue/artists list. For rock and roll and clubs, make sure you follow LengPleng.com as well. Tuesday 27 at Meta House from 6 pm, Cambodian Living Arts hosts a music exchange with renowned Israeli saxophone player Amir Gwirtzman. Tuesday 27 at Meta House at 7 pm, a screening of two documentaries about Cambodia’s late master painter Svay Ken: Passing knowledge by Erin Gleeson and Svay Ken Talks by Nico Mesterharm. Tuesday 27 from 6 pm at Cōnekla (St 51, between St 352 and St 360) presented by Orangutan Swing, interactive drawing and conversation. Henrik Akesson will share some exercises in collaborative drawing. BYO materials. Wednesday 28, at 6 pm, a special screening at Bophana Center of the documentary In Utero Srebrenica, in the presence of the director, Giuseppe Carrieri, with Q&A to follow. At Java Café on Thursday 29, Sophiline Arts Ensemble presents a preview of their dance, A Bend in the River, which will be presented in full at Chaktomuk Theatre next month. The show starts at 6.30 pm. Friday 30, Lotus Bar and Gallery (#53, St 2.5 Battambang) presents, The Revolution will not be televised, a monthly spoken word and performance night, featuring the best of Battambang’s poets, performers, alternative musicians and artists. From 7:30 pm. Saturday 31, Chhan Dina returns to Phnom Penh Community College to host a double clay workshop: head sculpture in the morning, vase or bowl in the afternoon. Bookings essential. Saturday 31 is the start of the second International Film Heritage Festival, nine days of over 50 films from all over the world, on the theme of laughter. Everyone from Chaplin to Tati, Monty Python to Marilyn Monroe to the Marx Brothers, and even a whole mini-season of James Bond parodies. All screenings at Chaktomuk Theatre and Bophana Centre, with additional activities at the Institute Francais. Meta House hosts a mini-exhibition by Sokuntevy Oeur including both new and older works. Until 8 June. At Sa Sa Bassac, a new exhibition, Rubber man, by Khvay Samnang. Until 12 July. Cages torn open, new sculptures and paintings by Chhan Dina at Meta House. “We are reminded of what we share with other living beings, and what we forget and deny. The paintings explode with colour, a confident assertion of the shared liberation theme. In paint, line and colour blur the distinctions between species, all swimming in the same soup; in fired clay, disparate characteristics are fused into one body.” Absolutely not to be missed. Finissage and meet the artist on 10 June. Cambodian Living Arts presents the exhibition Chhnang! about traditional and contemporary pottery making. CLA is located on Sothearos Blvd just south of St 294. Re-housing of Non Houses by photographer Fani Llauradó and artist Chhan Dina, combining photography and painting to explore the use of public and social space; plus a collection of large format paintings by Chhan Dina, reflecting her ongoing themes of life, music and everyday activities, at The Mansion (Sothearos Blvd, near St 178). DownTown Collective presents a new photographic exhibition opening at Equinox Bar (St 278 near Wat Lanka) entitled Phnom Penh Streets. You can view a preview at YouTube. Em Riem’s latest exhibition, Nature II, at Design la Galerie, #13D, St 178. New Leaf Book Cafe in Siem Reap, has a continuous exhibition for Small Art School, featuring the work of young aspiring Cambodian artists. Elegy: Reflections on Angkor by John McDermott. The award-winning American photographer maintains his strong presence on the Siem Reap art scene with his mesmerizing monochromatic fine art images of Angkor taken between 1995-2009. Now exhibiting in three McDermott Galleries located in the Old Market Area, FCC Angkor Complex and Raffles Grand Hotel d’Angkor. Plae Pakaa, a program of 3 rotating performances of Cambodian traditional arts at the National Museum of Phnom Penh. A Cambodian Living Arts production. Every Friday and Saturday, 7 pm (May to September); Monday to Saturday, 7 pm (October to April). Phare Ponleu Selpak, the famous Cambodian circus school offers nightly performances in both Siem Reap and Battambang, on a rolling cycle of different works. In Siem Reap: at 7.30 pm under the big top in Siem Reap, behind the Angkor National Museum, in front of Angkor Century Hotel. In Battambang: visual arts exhibition from 6.15 pm then circus show at 7 pm. Please choose the list/s best suited to your needs. Artists: the weekly guide, a weekly email reminder to provide details of events coming up, and any arts related classifieds directly to your inbox. Venues: you will receive the weekly guide and a weekly email reminder to provide details of events coming up. Patrons: you will receive only the weekly guide.